Firepits are created by dropping (Default: Q) three sticks on the ground, then using a firestarter or flint & steel on the block under them. Using the firestarter may take multiple tries before the firepit is successfully lit. Dropping a piece of straw in with the sticks will make the firepit easier to light. Firepits that are directly exposed to precipitation will not consume fuel, and will eventually burn out. To prevent this from happening, a block should be placed above the firepit to protect it. Once the firepit has been lit it will quickly burn out unless more fuel is added. In order to relight the firepit, at least one piece of fuel must be in the fuel slots, and a firestarter or flint & steel must be used to Right Click on the firepit. Firepits are used for making torches, cooking food, heating up low-tier items for smithing, and cooking sand to make glass. Firepits also provide a heat source for wrought iron grills. Note: Firepits cannot be used to smelt ore.
Fuel Input Slot - Input slot for logs and peat. Fuel placed in this slot will move down to the storage slots if they are empty. Fuel Storage Slots - Storage slots for fuel. Fuel is always consumed from the bottom slot, and fuel located in other slots will move down if the lower slots are empty. Temperature Gauge - An estimate of the current temperature of the firepit. Heating Slot - Input slot for heating items. This slot has a stack-size limit of a single item. Output Slots - Output slots for torches, glass, and molten metal. Ceramic molds must be placed in these slots to catch molten metal. Firepits will gradually heat items in the heating and output slots as long as it is burning fuel. Metal items that reach their melting temperature will combine with any empty or partially-filled ceramic molds of the same metal type in the output slots. If there are no ceramic ingot molds in the output slots, the melting metal will be destroyed. Items in a firepit can only get as hot as the current burning temperature of the fuel. A bellows can be used to increase the current burning temperature of the fuel, and heat the firepit twice as fast at the expense of consuming the fuel twice as fast. Note: Bellows only affects how quickly the firepit itself heats up. Items heating up inside of the the firepit will heat up at the same rate regardless of if a bellows is used or not. When the firepit runs out of fuel, or when it is exposed to precipitation, the items in the heating and output slots will start to cool down, and the firepit will eventually turn off. time Options related to time. This is a global multiplier for the rate at which items cool down. Increase to make items cool down faster. This is a global multiplier for the rate at which items heat up. Increase to make items heat up faster. Logs can be dropped ontop of the firepit block to be added to the fuel slots. Cooking an unshaped metal in the firepit will drain the metal out of the input slot and into a mold or partial unshaped metal stack beneath it, leaving an empty mold in its place. Firepit plays a sound effect when lit. Firepit temperatures are no longer affected by height or by having a 3x3x3 open space above them. Removed the four right byproduct slots in the firepit. 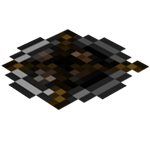 Firepits can no longer be used to smelt ore.
Firepits are no longer used in the creation of charcoal. Paper has been replaced with straw as the item used for increasing the chance of successfully lighting a firepit. In addition to placing fuel in the fuel input slot, it is also possible to add fuel to a firepit by simply dropping the fuel on the block. This way a player can drop an entire stack of fuel on the firepit, which will slowly be consumed permitted the items haven't been sitting on the block long enough to despawn. This page was last modified on 24 March 2015, at 23:56.